Thanks to the diversity of film genre, we had ventured into various lands’ music cultures. We have indulged ourselves in the Spanish-inspired flamenco style, treated to the classical European orchestral sounds and gyrated to India’s Bollywood numbers. 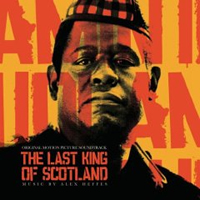 With this soundtrack for Kevin Mcdonald’s film, we are transported to 1970s Uganda where African tunes rock your world with their signature heavy rhythms. The generous 72-minute album features 12 song tracks featured in the movie. Those who have caught the picture on celluloid will fondly remember the fitting visuals that accompany these tunes. If not, these infectious cues will also catch on easily, with your mind forming pictures of happy Africans enjoying and swaying to the melodies. The soundtrack first introduces us to “Toko”, which self-indulgently goes on for almost eight minutes. It takes its time to layer itself, with various ethnic wind instruments building on the vocals. Listeners who prefer more consistent beats and catchier melodies will enjoy “Afro Disco Beat” and “Save Me” for their repetitiveness. These tracks carry on for quite a bit, and may not appeal to impatient ears. UK composer Alex Heffes (One Day in September, Imagine Me and You) provides six score tracks, which are inaptly interspersed between the song cues. Beginning with the ominous “Idi’s Story” and the darkly orchestrated “Ambush”, the trained listener can feel his gradual mood change as the album reaches a high point with the action-packed “Press Conference”, before coming to a sorrowful “Down Over Lake Victoria”. Heffe’s compositions appropriately infuse the African elements of intense percussions and exotic winds into the themes. In this part of the world, this is definitely an album with a music style which we won’t come across very often, so it is certainly worth embracing.